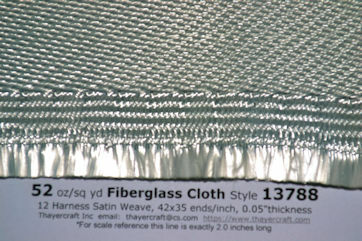 Style 13788 is a 52 oz/sq yd, 12 harness satin weave fiberglass fabric. 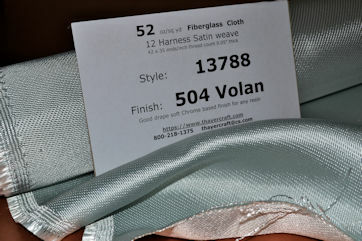 We have a couple hundred yards of 13788 in 38" in both 504 Volan and the 627 silane finish and some with the 497A inish. 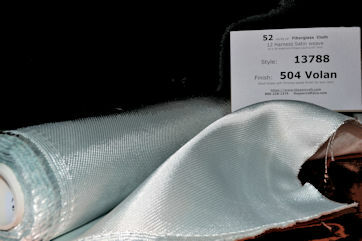 The cloth measures 39.5" overall which does not include the woven outer edge as seen in the photo. All rolls are rolled on 2" pvc pipe, packed in plastic and other cushioning material and corrugated wrap on the outside. 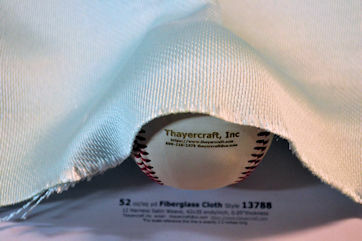 No tape is put anywhere on the cloth or any packing except for the very outside. Each roll has four labels with Style, width, finish and yards as well as oz/sq yd and construction data. To give you an idea of how much cloth your getting the following is the approximate weight of the glass your getting for each roll: 5 yards - 18 lbs. glass, 10 yards - 36 lbs. glass, 20 yard roll - 72 lbs. 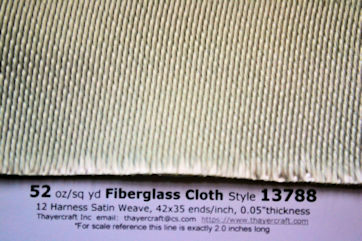 glass, 30 yard roll is 108 lbs of just the fiberglass cloth! This is not tooling cloth but a high strength aerospace type fabric with a high strength to weight ratio. Silanes are based on Silicone and are clear. BGF Industries good for any resin.